A beautiful 7.9 inch display, powerful A5 chip, FaceTime HD camera, iSight camera with 1080p HD video recording, ultra-fast wireless and over 275,000 apps ready to download from the App Store. 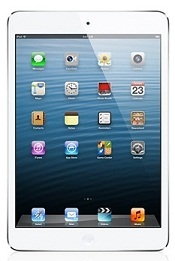 iPad mini is an iPad in every way, shape and slightly smaller form. Available in either 16GB, 32GB or 64GB capacity. 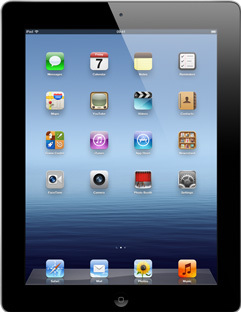 The Retina display on the iPad makes everything look crisper and more lifelike. Text is razor sharp. Colours are more vibrant. Photos and videos are rich with detail. All thanks to 3.1 million pixels powered by the new Dual-Core A6X chip. It's the best mobile display ever. The new iPad features a 5-megapixel iSight camera with advanced optics, a backside illumination sensor, auto white balance and face detection for incredible still images. And you can record 1080p HD video too. Up to 10 hours battery life while surfing the web on Wi-Fi, watching video or listening to music. Available in 16GB capacity & 8 colours, Choose from slate, silver, purple, pink, yellow, green, blue, or red. iPod touch now has a bigger, 4-inch Retina display the new display is a perfect widescreen fit for your HD films and TV programmes because now you can watch them all without letterboxing. The new iSight camera lets you take your best shots, share good times with friends over FaceTime. Shoot scenes in HD. 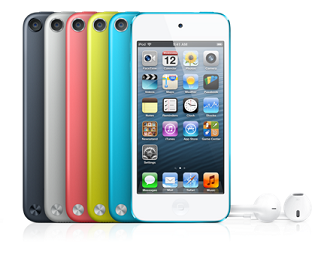 In fact, iPod touch has so much technology, you'll forget it's an iPod. 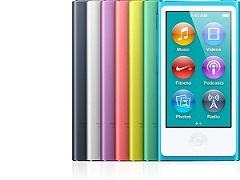 Available in either 32GB or 64GB capacity & 6 colours, Choose from black & slate, white & silver, pink, yellow, blue, or red. 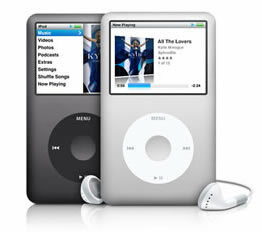 iPod classic gives you 160GB of storage capacity, which can hold up to 40,000 songs, 200 hours of video, 25,000 photos or any combination. And you get up to 36 hours of battery life, so you can keep on rocking for a long, long time. The vivid 2.5-inch display makes video come alive. Purchase or rent films, buy TV programmes and download video podcasts from the iTunes Store, then sync them to your iPod classic to watch anywhere, anytime. Sleek, polished aluminium. Five brilliant colours. Its main body is crafted from a single piece of aluminium and polished to a beautiful shine, so the new iPod shuffle feels solid, sleek and durable. And the colour palette makes it the perfect fashion accessory. Choose gleaming silver, blue, green, orange or pink.